“Two weeks ago I had to say “good-bye” to my canine search partner, Shakti. Although my heart is breaking still, I’m truly grateful to have shared 16 years of big adventures with this stunning Belgian Malinois. “Shakti” means “power”. Goddess of the Himalayas, she is revered in the Hindu religion. Shakti was a half-sister to my first search dog, Isis. A fielding member of Search and Rescue Dogs of Colorado and Alpine Rescue Team, she worked air scent, human remains and avalanche. 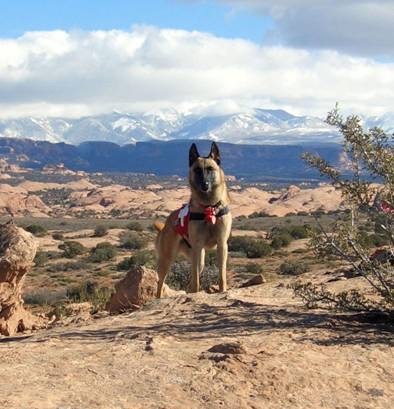 Like any self-respecting Belgian Malinois, Shakti was committed to everything she did and gave each task 150% of her attention; her focus was amazing while working in the wilderness or on avalanche debris fields. No situation (or person) could stand in her way. Together we certified in Animal Training and Behavior under Karen Pryor and Shakti developed an international reputation for herself in the clicker training community, at dog shows and dabbled in musical freestyle as well. Most of Shakti’s finds were deceased, simply due to the nature of the searches. One mission stood out because of its complex nature and brevity. A probable suicide, the subject’s truck was located on the road to Jones Pass in the Urad Mines area. Dale Atkins and the deputy had arrived, so she and I were able to start searching before the rest of the team joined the mission. We walked up the road to begin clearing an area. Shakti began to pull me into the trees. I communicated our plan and moved into the deep snow among the densely populated trees. Within minutes, Shakti became very excited, barked and started digging (her indication of an avalanche find) and jumped on me (her indication of a find in the wilderness). She was using her whole arsenal to tell me she’d found the subject who was dead and buried under almost two feet of snow.